Sometimes all it takes is a person, a story, a word to make a difference. With one connection a story goes from being facts to becoming personal, touching those who hear it and generally it takes a powerful story or a gifted storyteller for that connection to come through. 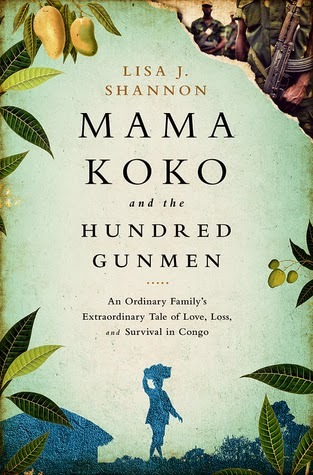 In Mama Koko and the Hundred Gunmen by Lisa Shannon readers are gifted with both. Lisa Shannon has long been known for her activism and her work among the Congolese people. Before the frenzy and fallout of Kony 2012 and afterwards when interest faded Shannon has continued to hold a place in her heart for the people who live the reality of a life unfathomable to many in North America. In Mama Koko Shannon takes the easiest and yet most painful route to further this need - she shares stories. Mama Koko is not a book for the feint of heart and, in fact, it's a story that will probably pain your heart or at least open it to the realities of life in an often overlooked part of the world. Shannon starts with stories of friendship, memories of a time in Africa most stereotypes don't often unearth due to convenience before delving into stories of loss, pain, and sadness that are often overlooked for the same reason. Shannon doesn't hold back as she recounts the stories of Heritier, Roger, Antoinette, and so many more tied together through Francisca and Koko. Young, old, living, dead, and those caught in between each are represented in these pages, each are given a chance to be heard. This is not a feel good book but it is a book worth reading if you are willing to learn and take this book beyond it's pages: grow in awareness, find an appropriate and certified venue through which to offer the recommended aid. I received this book through NetGallery as an advanced copy (release date is February 3, 2015) and the opinions are my own. Mama Koko is a book that will stay with me for a long time and occasionally brought me to tears as I was able to see a glimpse into this conflict with new eyes.